If you are tired of simple unicoloured nails, it is time to spice it up with some nail art. Very easy to do, even for those with unsteady hands, here are some simple nail art inspirations that are explained step by step, in writing and with pictures, for you. To get started, you should assemble your basic nail art kit. This will obviously include nail colours, basecoats and top coats, remover, cotton swabs, loose glitter, rhinestones or other baubles, striping tapes, dotting tools and nail brushes. 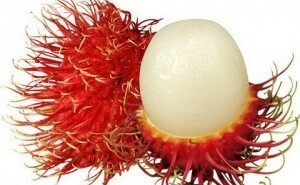 Don’t worry if you do not have all of these at home or can’t find any in the market. 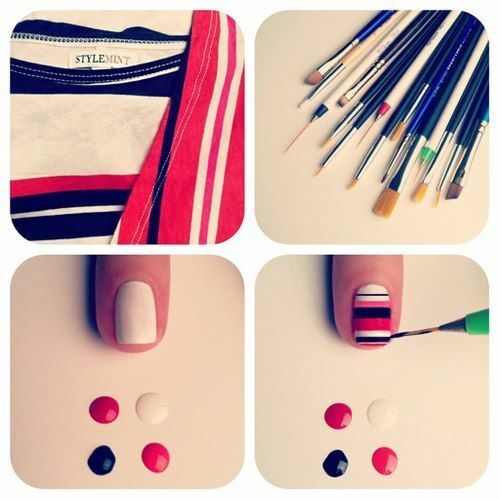 You can use items around the house to make simple nail art tools. Use a toothpick, an empty ball point pen or a sharp pencil for a small dotting tool, a pin head or a blunt pencil for a big dotting tool and normal paint brushes cut to different sizes as striping brushes. If you are out of striping tape, use normal sticky tape and nail paint to create lines. 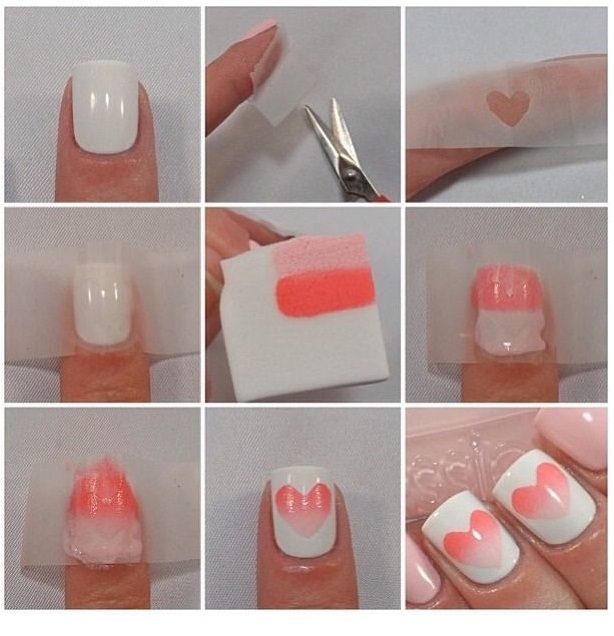 Make sure that the tape you are using does have very strong glue on it, as these are very difficult to work with; they can peel off the base coat when you stick it on your nails. Use a tape with poor or moderate glue strength. 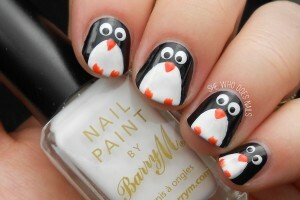 Remember, your nails are a very small canvas and it is essential that the art you choose is not too crowding. 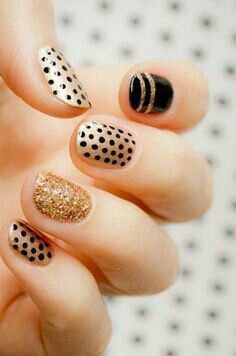 Also if you are fairly new to this, I would recommend you start with the simpler bigger art, such as the block and dotted designs to get a feel for it, and then move on to more intricate manicure magic. Point to remember: Always put your basecoat first and then finish off with a clear topcoat in the end to protect your nails. As the name suggests, this design requires you to go bold with your palette. Begin by painting all your nails except one in blood red. You can also use a deeper shade of red – say ox blood, which gives a richer, darker shade. For the accent nail, paint it all white first and let the polish dry. When fully dry, stick thin strips of sticking tape across the nail horizontally. Make sure the strips stick to the nail at each end. Paint over the strips with the red polish. Remove any extra polish around your nails using a remover. Pull off the strips slowly to reveal a red and white ribboned pattern. Another design to match with your holiday jumper. 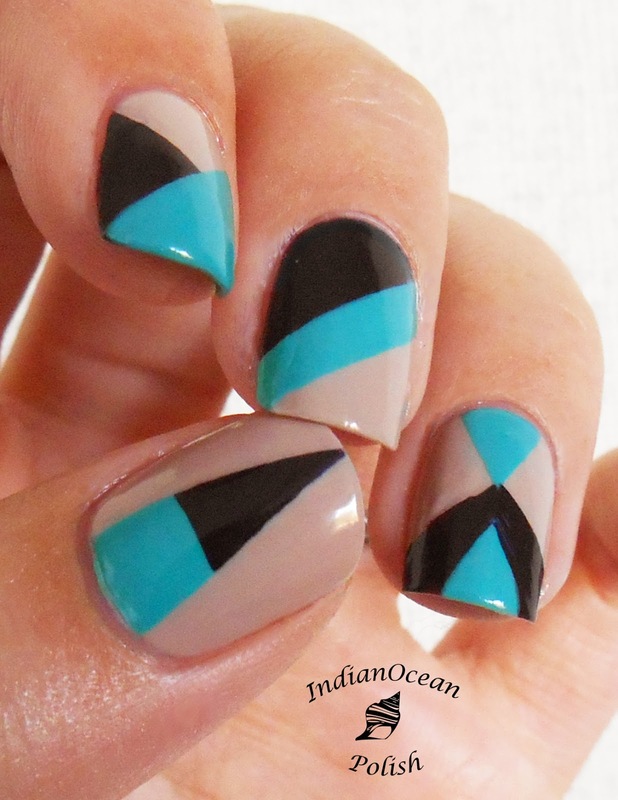 If you are fairly confident with the brush, you can create a multi-coloured striped pattern on your nail. First paint your nail all white and wait for it to dry. Choose nail paints in few other contrasting shades, red and black, or green and blue, or yellow and red, or any combination that works for you. Dip your brush into one of the colours and steadily draw a horizontal line across your nail. You should start drawing at the base of your nail and then build up on the stripes using brushes of varying width to finish the pattern. If you are not very confident using the brush, you might want to start by using a permanent marker to create designs on your nails. 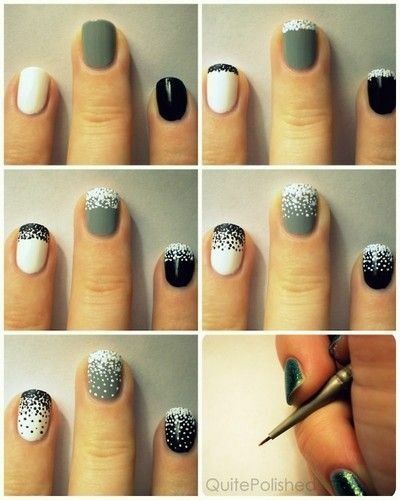 Paint your nails in monotones such as black, gold or white. Wait for them to dry completely. Then using a golden or black marker (as suited), you can make any design on your nails. You can give your nails a golden french manicures or accent them with chevron stripes or place simple golden hearts and dots on all. The best bit about this is that if you make mistakes, you can easily erase it using rubbing alcohol. After you are happy with your design, run a layer of top coat over the nails to prevent the ink from being smudged due to contact. Paint your nails with the base colour and let it dry. IT is usually wise to pick a light base colour as it allows the other block parts to be painted in brighter shades. After it is completely dry, stick some tape across a part of your nail diagonally. Paint the exposed part of your nail over the tape with a contrasting colour. Remove the tape and let the second colour coat dry. 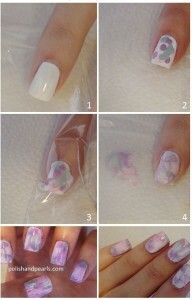 Repeat the process with another colour if you like, this time taping a different section of the nail. Remember to let the colours dry in between tapings. Paint your nails entirely in in one base colour or in colour coordinated shades. Here we have picked white,grey and black. When the base coats are dry, use you big and small dotting tools to create a dotted fade effect. Dip the big dotting tool in the polish and begin dotting closely on the top edge of the nail, working your way downwards. As you move down, increase the gaps between the dots and decrease the size of the dots or move on to the smaller dotting tool. End a little above half way through the nail. Put a light colours base coat and let it dry. 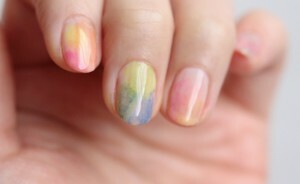 After it has tried, dab a few shades of pastel nail paints on the nail. Wrap the nail in a plastic and tease the plastic over the nail. The colours will smudge into each other like water colours. Remove the plastic gently and let the nail dry. Finish with a clear top coat. Colour your nails white. After they have dried draw three lines in black near the edge of the nail with a permanent marker or brush. Use the big dotting tool to make two dots, then use the brush or marker to connect the dots and form musical notes. 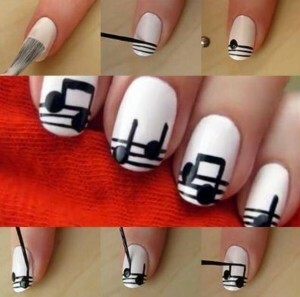 You can draw different notes on different nails. Paint your nails (except one) in a shade of navy blue polish. 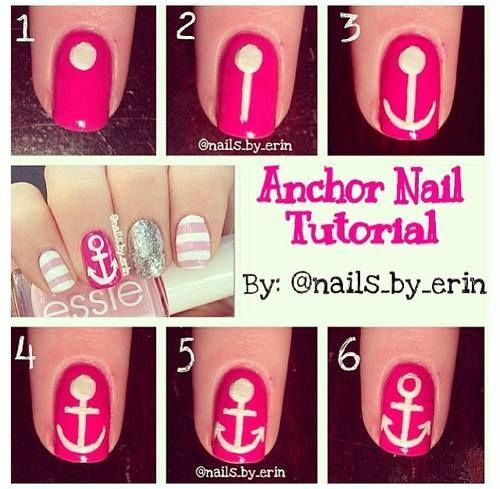 To make an anchor on your accent nail in white, put a dot near the base of your nail using the big dotting tool. Then use the thin nail brush to draw a vertical line and a smile at the bottom. Add the finer details to the anchor. 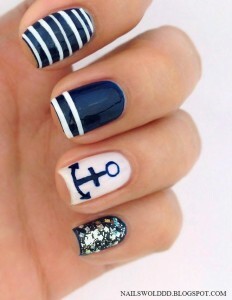 You can add two or more stripes and some glitter on the other nails for additional effect. Paint your nails white. Cut out a heart shape on the sticking tape and paste it on your nails. Take a piece of sponge and apply two thick lines in contrasting shades next to each other. Dab the sponge over your nail a few times until you can see a gradient of colour. Do not rub, just dab. Remove the sticking tape and let it dry. You now have ombre hearts. Paint your nails in dark blue. Use a thin nail brush dipped in white polish to draw three lines radiating from one corner of your nail. Add subsequent branches to the lines to make it look like a smowflake. 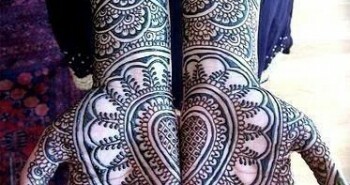 Repeat the design on one or more fingers. 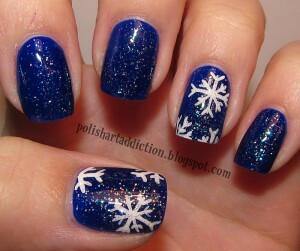 You can add a glittery top coat for a festive feel. Cover most of your nails / accent nail with moon shaped black dome/s. Let it dry, then paint another smaller dome inside the black one in white. Using your big dotting tool, add two drops of white on top of the white dome for eyes. Using your thinnest paint brush, draw in the eyes, beaks and feet. You can also use a marker if you feel you are not very steady with the brush. Wash you nails thoroughly with soap to get rid of oil on your fingers. Apply the basecoat in a colour so that the print on the newspaper can show better. Let it dry thoroughly. Pour a bit of rubbing alcohol in a cup and dip your finger nail in it for 5 seconds. 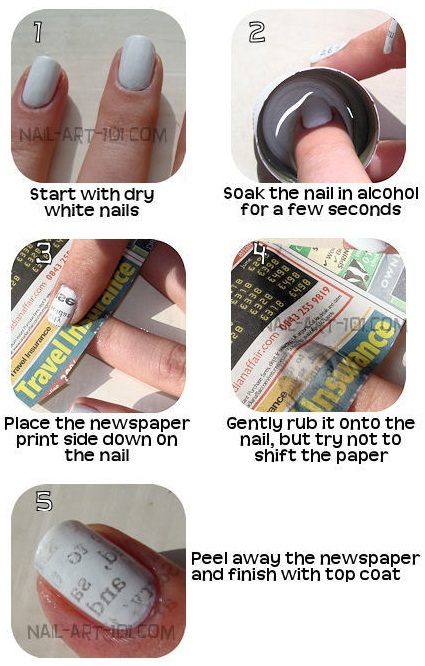 Take a piece of newspaper and press it firmly on your nail for a few seconds. Peel it off slowly. 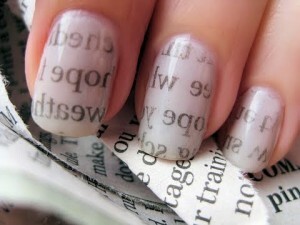 The ink from the newspaper will transferred to your nails. Apply a clear topcoat to prevent the print from rubbing off.